This month at Intertops Casino enjoy epic entertainment and win legendary prizes! 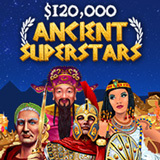 Compete with other players for $30,000 in weekly bonuses during the $120,000 Ancient Superstars bonus contest. Earn points when you play casino games and you'll be ranked on a Scoreboard. You can earn points playing on your desktop or laptop computer or in the mobile casino on your smartphone or tablet. Every week, the top 300 frequent players win bonuses up to $500. "Competition for the biggest money can be quite intense," said one regular player. "Everyone wants to move up a few places on the Scoreboard and qualify for a bigger bonus!" Intertops Casino players earn points when they play and get weekly bonuses up to $500 each. Even occasional players can win prizes. The top 20 each week will be entered in a draw for a $1000 cash prize (with no wagering requirements). Later this month, the world’s most trusted online casino will unveil a new Christmas slot game called Swindle All the Way. It's a hilarious new game from Realtime Gaming where cunning thieves try to steal presents from under the Christmas tree. It has a bonus feature in which players pick a window where the thieves could be hiding in order to reveal prizes of up 60 free spins with up to 33X multipliers. It will join Christmas classics like Rudolph’s Revenge and Naughty or Nice.